Scotland's history has many interesting tales about heroes, castles, wars with England, wars between the clans (some people joke that when Scotland was not in a fight against England, it was fighting against itself), unions, clearances, and the constant struggle for independence (which was recently revived in the 2014 referendum about whether Scotland should be independent from England). This article will not be able to cover thousands of years of history, so we will simply focus on a few important events that shaped Scotland. Once the glacier retreated and left the area that would later be known as Scotland a fertile and attractive place, hunter-gatherers from other regions came to explore the new, exciting region. Celts, Scots (who actually came from Ireland), Vikings and Anglo-Saxons all had an interest in Scotland. And that interest was not always peaceful when other people were discovered in a desirable location. 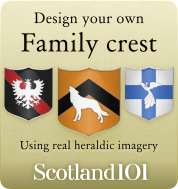 It was not until the 1100s that Scotland was turned into a feudal kingdom by David I. It was named the Kingdom of Alba, and it won't come as a surprise: it was modeled after its “beloved” Southern neighbor England. The Scottish people were not a happy bunch after Edward I invaded the country. They wanted to get rid off their occupiers and gain independence for their country. 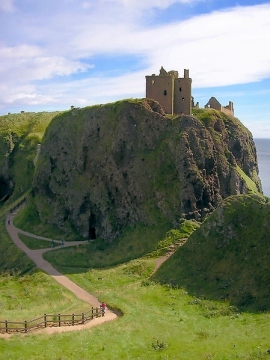 This is where William Wallace comes in – and do not make the mistake to believe that he really was such a great, courageous hero with a good character as portrayed in the movie “Braveheart”. All Scottish with a bit of historic knowledge will tell you otherwise. Yes, he did defeat an English army at the Stirling Bridge, but much else of the movie is just pure fiction. 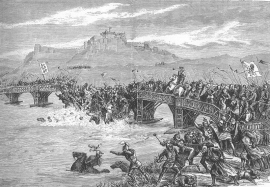 In 1298, just one year after the victory at Stirling bridge, Edward I manages to defeat Wallace, and a few years later William Wallace is executed. So much for Scottish independence. It should all change once Robert the Bruce (who was not a very nice man and apparently inspired by a spider) was crowned the King of Scotland in 1306 – a year after Wallace was executed. Another year later, King Edward I dies, and Edward II takes the reign. Robert the Bruce and his inspiration from a spider was too much for the English king and he suffered a defeat at the Battle of Bannockburn (in the year 1314). Scotland finally was – at least de facto – independent. In 1320, the pope approves the declaration of Arbroath, and Scotland officially becomes an independent nation. Apparently the document was so impressive that Thomas Jefferson was inspired to write the American declaration of independence after reading it. Another milestone happened in 1328 Rob the Spiderman and Edward III (yes, another English king named Edward) signed the treaty of Edinburgh-Northampton. Scottish independence would not last forever though. From then on everything becomes quite a mess involving kings and queens, cousins and daughters and countries being united under one king. James IV was king of Scotland and also became King James I of England after the death of Queen Elizabeth I (she related to James in a complicated way, and had neither husband nor children, so the crown would fall to James). Queen Elizabeth, by the way, was responsible for a Scottish Queen. So you see, they are all quite nice people. Anyway, the Union of the Crown meant that even though Ireland, Scotland and England were independent countries, they did share the same king. During the messy and complicated war of the three kingdoms (Irleand, Scotland, England), kings get killed, go into exile, and return. Scotland still has its independence though, so that is all not a problem. Scotland lost its independence in 1707 with the act of union. This act combines England and Scotland into Great Britain with a single parliament in Westminster. And it still is that way today even though there recently was a referendum in which the Scottish had a chance to turn Scotland into an independent country once more. The Highland Clearances are (another) dark chapter in Scottish history, and one of the reasons why there are many people with Scottish ancestry outside Scotland. The farmers and crofters in the Scottish Highlands had to leave their farms (often force was used) because the landlords thought putting sheep on the properties would be more profitable than having farmers. You can still see quite a few abandoned places in the Scottish Highlands these days, and people in the Highlands will only be too glad to give your their opinion about the clearances. They have an effect on the Highlands even today.